When picking, having both hands free to unpack, rearrange or sort goods increases productivity. 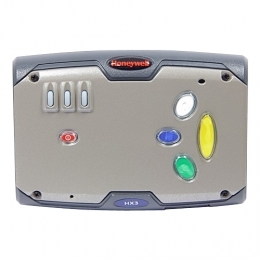 The HX3 from Honeywell, offers this option thanks to its wrist or hip holder. The large function keys, partially with multiple assignments, ensure for flexible input. The innovative ToughTalk technology ensures for even simpler handling, since it allows you to combine voice commands via a headset with a practical 1D or 2D ring scanner. Weighing only 264 g, the HX3 is highly ergonomic, plus works intuitively and efficiently. There is a 512 MB Flash memory available for data input. Communication is ensured by its standard 802.11 b/g Wi-Fi connection. Plus, 12-hour battery life provides for uninterrupted work, and a high degree of mobility. The optional high-performance battery provides the HX3 with enough power for up to 24 hours of operation. Thanks to its magnesium alloy housing and IP54 certification, this device is highly robust and made to last. Honeywell Case - Voice case, with viewing windows, for belt mounting, for Honeywell HX3, requires battery case: HX2A411BATTCASE.